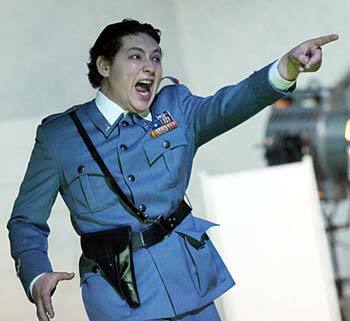 Elena Habermann wrote in November 2018 in the magazine Der Neue Merker on Alik Abdukayumov’s FRANZ in ‚I Masnadieri‘ at the Vienna Popular Opera. 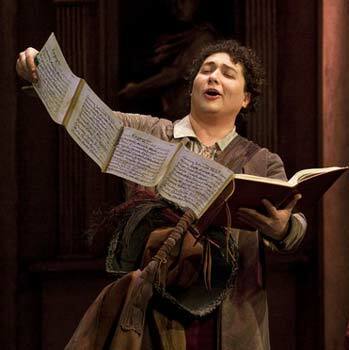 Since the season 2010/2011 the baritone is a regular guest at this opera house, singing such roles as PETER (Hänsel und Gretel), ESCAMILLO, MICHELE (Il Tabarro), TONIO (I Pagliacci ) and GIORGIO GERMONT and PRINCE IGOR, being especially popular with the Vienna audience. In 2019 he also returns as MICHELE in “Il Tabarro” to the Popular Opera. Guest performances brought the artist also to the Budapest State Opera as PAOLO in ‘Simone Boccanegra’, FORD in Falstaff, LEPORELLO in Don Giovanni and MARCELLO in la Bohème. MARCELLO he also sang at the Opéra de Montpellier. He enjoyed huge successes as KOTHNER, GEISTERBOTE (Frau ohne Schatten). 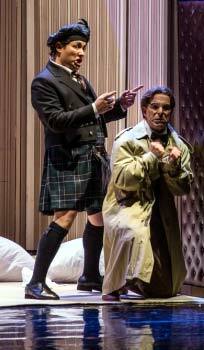 He was LEPORELLO and FIGARO at the Opera House Graz. 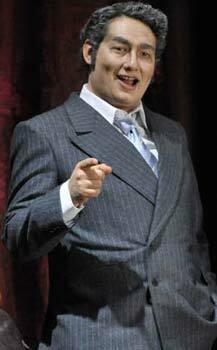 Besides, he sang FIGARO at the Stuttgart State Opera. And he succeeded in LEPORELLO at the Eutin Festival and the Hamburg State Opera. Subsequently, the young singer won the First and the 2nd Prize and additional Special Prizes at more than ten national and international Singing Contests – awards for an exceptional voice. In summer 2007 he was a semi-finalist at the international Domingo Singing Contest OPERALIA in Paris. 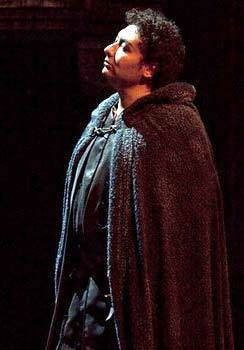 Alik made his German debut at the age of 26 as Posa in Don Carlo at the International Chiemgau Music Festival. 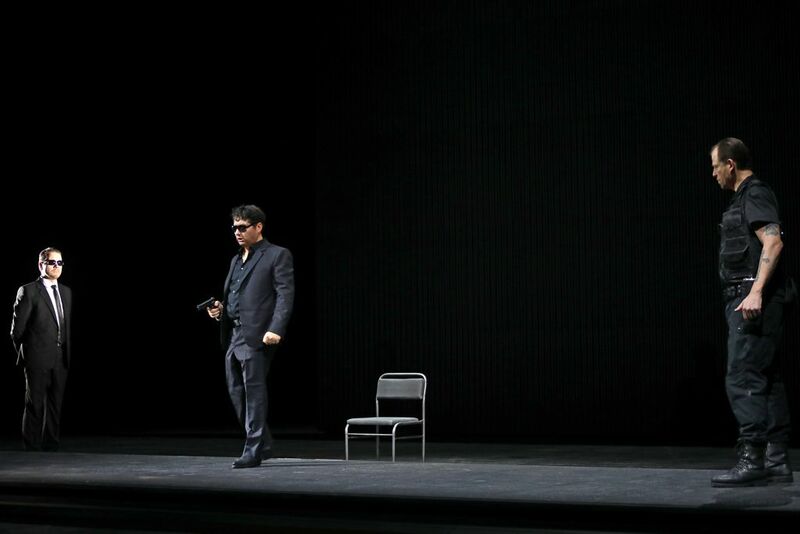 Since 2007 Alik Abdukayumov regularly sings at the Linz Opera House, where he performs such roles as EUGEN ONEGIN, LESCAUT, GIORGIO GERMONT, EDUARD (News of the Day), POLICE INSPECTOR (Lady Macbeth of Mzensk), RENATO and many others. Soon he became the public’s favourite here. 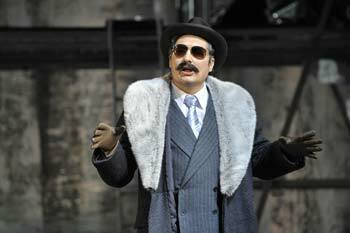 In 2009/201 he returned to Linz as SHARPLESS and LINDORF/COPPELIUS/DR.MIRAKEL/DAPERTUTTO. 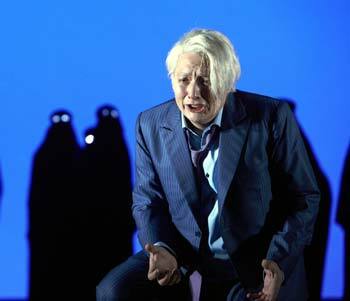 In these very roles, he also impresses at the Düsseldorf Rhine Opera . 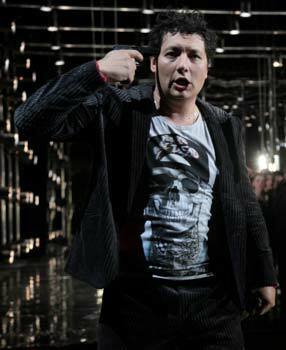 Alik Abdukayumov is also very much in demand as a concert singer. He was already heard with compositions of Bach, Händel, Orff, Stravinsky and Saint-Saens in France and Russia and in 2007 in Tokyo together with Elena Obraztsova. With the Bruckner Orchestra Linz he sang Beethoven’s 9th Symphony and with the Dresdner Philharmonics he sang MAMMA AGATA in Viva la Mamma. The baritone works with such producers as Alexander Schulin, Johannes Erath, Olivier Tambosi, Marco Arturo Marelli, Andrea Moses, Uwe Laufenberg, Vera Nemirova … and conductors such as Ivan Anguélov, Dennis Russel Davies, Johannes Fritzsch, Michael Sanderling, Keri-Lynn Wilson… Since the season 2012/2013 the baritone succeeds performs at the Weimar National Theatre in such roles as SHAKLOWITY in ‘Chowanschtschina’, SHARPLESS, GERMONT, FORD, ALBERT in ‘ Werther’, the HERALT, PAPAGENO, MARCELLO, FRANCESCO in Verdi’s ‚I Masnadieri‘ and JAGO. He sang KOTHNER at the Erfurt Theatre and as ENRICO in ‚Lucia di Lammermoor’ he made his debut in the season 2015/16 at the Chemnitz Opera House and performed this very role at the Opera House Leipzig in the dseason 2016/2017. He returned to Leipzig in the season 2017/2018 as SILVIO in ‘I Pagliacci’. The wicked, sly Francesco, just as evil as Jago, is one of Alik Abdukayumov’s prime roles. This baritone keeps getting better and bigger. Everything sounds delightfully magnificent and results in a secure belcanto blaze. He is a perfect actor, who is involved without any outrage. This voice of such a perfect quality is ment to sing at the Vienna State Opera. 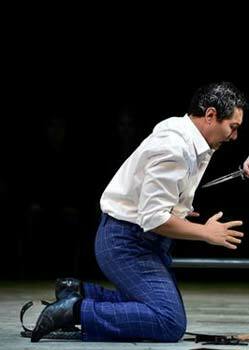 In this very scene the Uzbek baritone Alik Abdukayumov was very impressive. His Francesco was just as sly as Jago. Moreover, Alik presented a perfect singing performance. And that’s for the benefit of Alik Abdukayumov’s Renato. 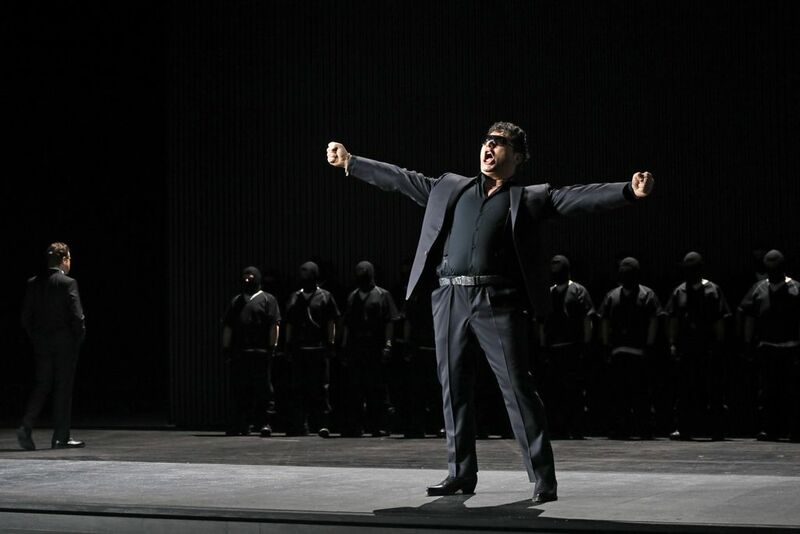 As already in the role of the villain Franceso in Verdi’s “I Masnadieri”, he is someone whose suffering and feelings of vengeance stream out of his pores with an impressively slow intensity. He doesn’t need to swing the baritonal club. After his promptly defeated feelings of aggression towards Amalia, he uses compelling vocal diplomacy. He and Caterina Maier turn the scene with Oscar into the highlight of the evening. …altogether he succeeds in giving a decent role portrayal. In huge and good vocal condition and both of them very enthusiastic were Alik Abdukayumov as Silvio and…. Dear opera lovers, the name Alik Abdukayumov is really to be savored - it will definitively serve you as soul food more often… His first big Verdi role, in which we could see the young baritone from Uzbekistan, was truly sensational! The fact that he had to sing it in German, did in no way smaller the effect. Although we know Alik from interviews as an exceptionally congenial, very intelligent and learned person, he succeeded in giving a persuading portrayal of Franz as a slimy, sneaky cheat and ruffian. The artist knows how to use his beautiful baritone voice, effortlessly harmoniously flowing in every volume and pitch in order to expressively cash in on it. He seemed to let his thoughts of revenge flow into plain vocalisms. One became the feeling he really enjoyed them. And Franz’ plans on how to harm the scoundrel and his opponents were sung so smoothly, it sounded like pure seduction. Absolutely delightful was his performance in the huge scene with Amalia in the 2nd act: at first he smarms over her with balsamic singing. But after noticing her refusal, he suddenly changes sides, vocally wallowing in thoughts of revenge and threats of violence. As declaring his repentance to the priest ( here = father) in the 4th act, he mocks himself, helplessly gesticulating, only to, in the following, deliberately catch a textile band and wrap it around his neck in order to kill himself. A considerable character study, a real must-see and hear. The most consistent figure was created by Alik Abdukayumov. 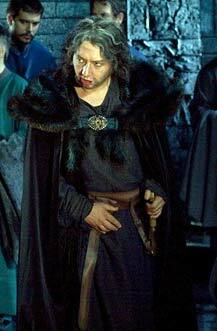 His Pizarro also vocally emitted dark evilness. Alik Abdukayumov, brilliant as a Pizarro with abysmal malice wiht every ferinement. 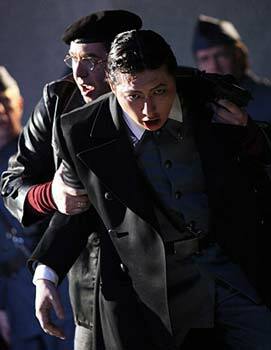 Don Pizarro in Mafialook (with dashing power: Alik Abdukayumov). 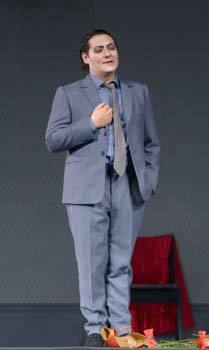 The baritone portrayed Taddeo with great enthusiasm. Such a rich and noble voice like Abdukayumov s is seldom heard. 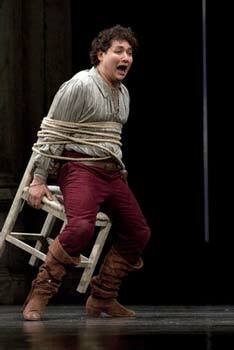 The singer is predestinated to sing the belcanto repertoire including Verdi. The "pappataci" calls, which he alternately sings with his congenial baritone collegue Alik Abdukayumov, playing Taddeo with great thusiasm, at the end of the opera, will be remembered for a long time. Such a colourful and noble voice as it is Abdukayumov's, is seldom heard. The singer is truely predestinated for the belcanto repertoire. Taddeo alias Alik Abdukayumov truely counters Isabella, he isn't just whining. In full possession of his powerful, perfectly trained voice, which at the most needs a slight final touch, concerning its noblesse, the Usbekian Alik Abdukayumov brought an Enrico Ashton of the highest caliber on stage. There was nothing left to be desired. 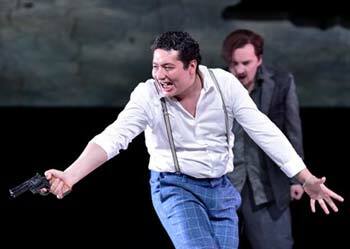 '…the baritone Alik Abdukayumov in the role of Enrico, whose vocal performance can only be named world-class. The rich, warm sound of his voice, the brilliant peaks, the wonderful mezza-voce. All this brought him already after his aria „Cruda funesta smania“ a big applause from the audience. 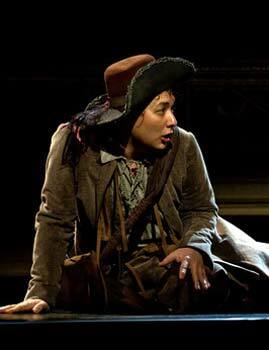 For the title role she succeeded in gaining Alik Abdukayumov , who especially come from Weimar for this occasion. It's the first time the baritone sings the role of Macbeth and he ensured the enthusiastic audience an unmatched listening experience. His powerful voice has a particularly noble timbre, sounding world class both in the opulent deep and the brilliant high notes. Undoubtedly, this singer, who is also a very good and intelligent actor, has one of the most beautiful baritone voices of our time. It was repeatedly confirmed by the competent audience that his singing reminds of many of his great famous predecessors. In future Alik Abdukayumov is in for great things, hopefully also in Vienna.